Remember, the days we bought plane tickets from travel agents? Yes, you rang your travel agent, told them where you wanted to go, dates and times. They either spoke to you on the phone or called you back with a plan. If changes had to be made, calls back and forth, a lot of work for a day trip from one capital city to another. So what now? We jump on the internet, find out what's available and book immediately. How long was that? 10-15 minutes maximum, if you know what you're doing! We pay credit card with 30+ days credit and get loyalty program points. We now book flights anytime, anywhere, plus cars, accommodation and more, all in one CONVENIENT location. Making the entire experience EASY!! How did Good Food Warehouse come about? Finding it difficult to source and buy from many Suppliers? As a food service operator you are always on the scout for good quality products that will offer your business a point of difference. Finding product is only half the job and a time hungry project, you call producers, suppliers, distributors and search on-line, only to find out you are making many email/phone orders, many payments which becomes all to hard!! Finding it difficult to get your products in front of Buyers? As a food producer, AKA: Supplier/Manufacturer, it's an endless struggle to find sales avenues that don't out price your product or impede on the quality of your product....let alone destroy your brand! Just like the airlines and many other services now, we decided to use the internet because it's EASY and CONVENIENT. We know Australia has an amazing array of wholesale food and beverages, that customers continually struggled to find and buy. We believe Good Food Warehouse provides the mechanism and know-how to close the gap between food producers and food service operators. We allow producers to sell their product directly to trade customers across Australia. We provide the trade with a time saving one stop warehouse where a number of fresher products can be purchased. We've built a model that creates a win-win for suppliers and customers, without adding heavy costs and out pricing the market. Yes, the internet allows us this luxury. You can't get an easier ordering model, you can browse and check pricing in your own time, you pay by PayPal, credit card or direct deposit and the order is delivered direct from the Suppliers to you, making the product as FRESH as it gets! CONVENIENT, yes, you can do this for many suppliers, place one order, one payment, one invoice and it's all done. Each supplier will pack your order, send it and yes its freight free, the product price you see is the price you pay. 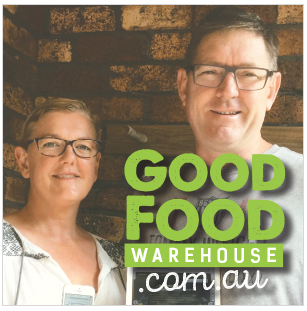 Located on the sunny Gold Coast, Good Food Warehouse operates Australia-wide with customers interacting on-line daily. The team at Good Food Warehouse strives to answer questions quickly either via Live Chat, phone/email support and via the extensive knowledge base. People are our cornerstone. We continually work at providing a rewarding service both personally and professionally to ensure no stone is unturned! Our producers are passionate about their products and with our help we'll grow their brand awareness nationally, provide customers with products they never thought possible and continually develop a service for them that is second to none. Ordering Wholesale Food and Beverages for your Business has never been easier - all orders are produced, packed and delivered direct to your business, making sure you receive the freshest possible product - FREE DELIVERY AUSTRALIA WIDE, 100% MONEY BACK GUARANTEE..offering you easy access to great producers - just place one order, one payment and we'll take care of the rest.